REGGIO-EMILIA, Italy – RCF honored its independent manufacturer representatives with a trip to Italy to tour the RCF headquarters and manufacturing facilities. 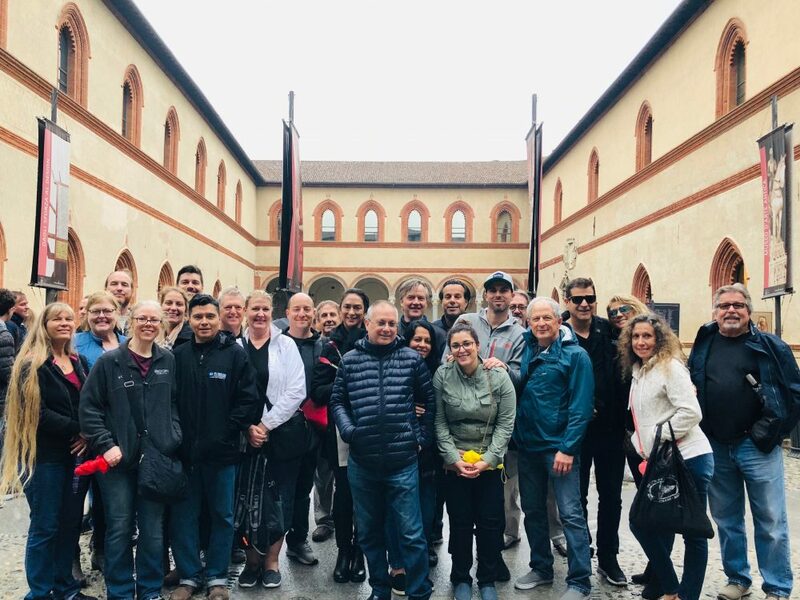 In celebration of sales and marketing efforts by the independent manufacturer representatives of RCF in the United States, the group was honored with a trip to Italy and a tour of the RCF headquarters and manufacturing facilities. Members of the rep force from On the Road Marketing, Quest Marketing, Eaton Sales, Bob White Associates, Ludwig Marketing, Cowser Marketing, Marshank Group, J.A.M.S. and Audio Source joined the RCF USA management team on the trip. RCF is an Italian loudspeaker manufacturer headquartered in Reggio-Emilia. The group had the opportunity to see the actual manufacturing processes of the RCF product. In addition, they got to hear many of the new products that are forthcoming in the new RCF display showroom. All was not work for the group. A tour of Milan took them to sights including the Sforza Castle and Milan Cathedral.